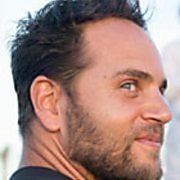 Jason Nemer is the co-founder of AcroYoga. He has been blessed to have many great teachers on his path. His family was always very supportive of his many passions. His younger brother brought him into gymnastics and from there he found acrobats playing at the gym and was hooked on both. During his teenage years he trained with some of the top Russian and Bulgarian acrobatic masters. Competing among the best acrobats in the world inspired his practice and taught him about humility. In 1991, after 4 years of dedicated practice at the age of 16, Jason represented the US at the World Championships of Sports Acrobatics in Beijing. In 1996, he performed acrobatics in the Opening Ceremonies at the Olympic games. Yoga came to him in his last semester of university in 2001. After that first class there was no looking back. Connection to the breath and the lifestyle philosophy of yoga filled him with so much joy and new ideas of how to bring his past passions into a new form. Currently he travels to teach, study and bring communities together. He believes this practice can be used as a tool to heal and connect people in a playful dance that can promote global peace.